This is the second of the bricks-and-mortar Tincan Coffees, the Bristol-based company which started life serving coffee from vintage Citroen vans. It follows hot on the heels of the first Tincan Coffee on North Street (ironically on the south side of Bristol). Clare Street opened at the end of last year, joining the cluster of speciality coffee places in the heart of Bristol, including the (now venerable) Small St Espresso and Full Court Press, along with relative newcomer Playground Coffee. Tincan has a range of hot food from a brunch menu (served from 10am to 4pm), backed up with sandwiches and cakes served throughout the day. It’s a much larger space than its near-neighbours, probably offering more seating than all three combined! The coffee is from Clifton Coffee Roasters, with a bespoke seasonal house-blend and single-origin on espresso, plus another single-origin on bulk-brew. Unusually, the single-origins on offer are different in the two Tincan branches (in my experience, for economies of scale, its usual have the same coffee at each branch). These are changed when the current batch runs out, usually every two weeks or so. For non-coffee drinkers, there’s tea from Brew Tea Co and Kokoa Collection hot chocolate. December 2017: It appears that the Clare Street branch has closed, but the original North Street branch is still going strong. Thanks to Mike Stanbridge for the heads up. You can read more of my thoughts after the picture. There was supposed to be a gallery, but at the time I published this piece, I was travelling and my laptop was broken, so I wasn’t able to edit the pictures. Since then, the Clare Street branch has closed, so I have decided not to produce a gallery. 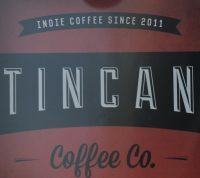 There are plenty of similarities between Clare Street and the original North Street branch of Tincan Coffee. However, it’s a very different space, wider and more open, which means (to me at least) that it feels a lot bigger. The ground floor is bright and airy, while there’s also a spacious basement, giving Clare Street multiple seating options. In all, it probably has twice North Street’s capacity. The front, looking out onto Clare Street, has a four-segment, concertina window, with a recessed door on the right, plus a smaller window beyond that. There’s also a row of long, narrow windows at the back, overlooking St Stephen’s Church, perhaps one of the nicest views from a coffee shop that I’ve seen in a long time. When it comes to seating, you’re spoilt for choice. The counter is on the right, a lovely tiled affair, with, on the front, a corrugated (tin?) section. The seating is mostly to the left, a row of three, high, four-person tables running down the centre, with three, four-person booths against the left-hand wall. At the back, a four-person window bar overlooks the church, while there are a pair of small, round tables in the windows at the front. Finally, if you want somewhere more cosy, there’s another small, round table tucked away in the window to the right of the door. If that wasn’t enough, there’s also the basement. Reached by a flight of stairs in the back left-hand corner, this is another lovely spot, done out in wood, with tables running around three of the walls, ahead and to the left and right as you come down the stairs. A little more detail from the photos? Although you order at the counter, if you’re staying, you’re encouraged to take a seat, where you’ll find menus on the tables. I was there for brunch, although if the brunch menu was served before 10 o’clock, I’d have come for breakfast. Having had the baked egg at North Street, I selected the poached eggs and crushed avocado, which turned out to be a veritable mountain of food. Buried at the bottom were two slices of sourdough, followed by a layer of roughly chopped avocado, topped by two poached eggs, one smothered in green salsa, the other in red salsa, adding an interesting touch. As if that wasn’t enough, I’d added a side of beans, Tincan’s take on the classic baked bean, which arrived heaped on the side. Finally, the whole dish was rounded off with cherry tomatoes, which, appropriately enough, rolled around the sides of the plate. It was delicious, from the perfectly poached eggs through the avocado to the two salsas which added flavour without overwhelming me. The only caveat is that if you like crisp toast, ask for it to be served on the side, since as constructed (which, in fairness, is how it’s described on the menu), the bread ends up quite soggy. I enjoyed it that way, but I know some who wouldn’t like it. I had a surprisingly large cortado (it’s actually flat-white sized). Having tried the house-blend at North Street, I had the single-origin, a Colombian. Size notwithstanding, it was excellent coffee, a rich, dark taste (although not a dark roast), the coffee coming strongly through the milk without conflicting with it. Liked this Coffee Spot? Then check out the rest of Bristol’s speciality coffee scene with the Coffee Spot Guide to Bristol. This entry was posted in Breakfast, Bristol, Cafes, Cake, Closed, Laptop Friendly, Lunch, Sandwiches and tagged Clifton by Brian Williams. Bookmark the permalink.